New! - The Surya Molana Collection features 100% Tencel hand loomed rugs, that are made in India. 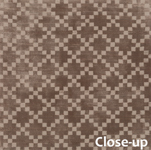 These low pile rugs feature lustrous sheen and loop accents.